It’s no secret that dogs love to sleep. Founded by a Marine veteran in 2009 as an e-commerce provider of specialty linens, eLuxurySupply has quickly grown into much more than that. They now offer hundreds of products in the home and garden space, from sheets and drapes to towels and mattresses. 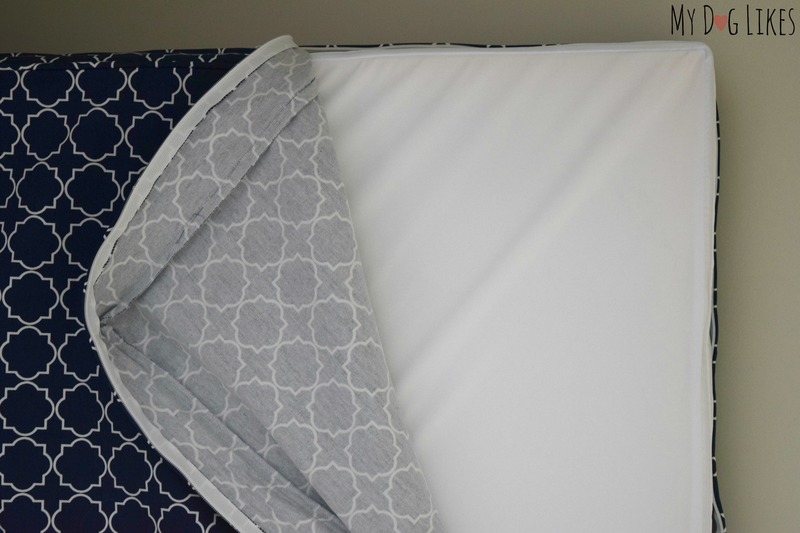 Since acquiring a mattress pad company a few years back, eLuxurySupply has crossed over from simply selling goods and now manufactures many of their own products as well. In house manufacturing allows them to offer goods of the highest quality for more affordable prices than many of their competitors. This move has paid off big time and they are now officially one of the fastest growing companies in America! Not bad for a company that started out of a garage in Evansville, Indiana! 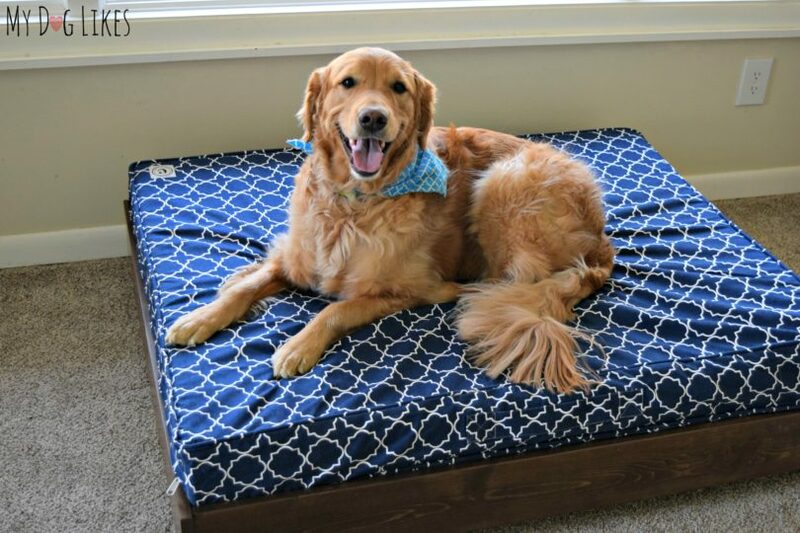 Recently, eLuxurySupply decided to take their bedding expertise to the pet market with the introduction of a line of orthopedic dog beds and crate pads. They were kind enough to send over a bed (with corresponding wooden frame) for us to take a closer look at! A quick browse of their website (and the countless five star reviews) had us pretty excited about the quality of products that eLuxurySupply had to offer. 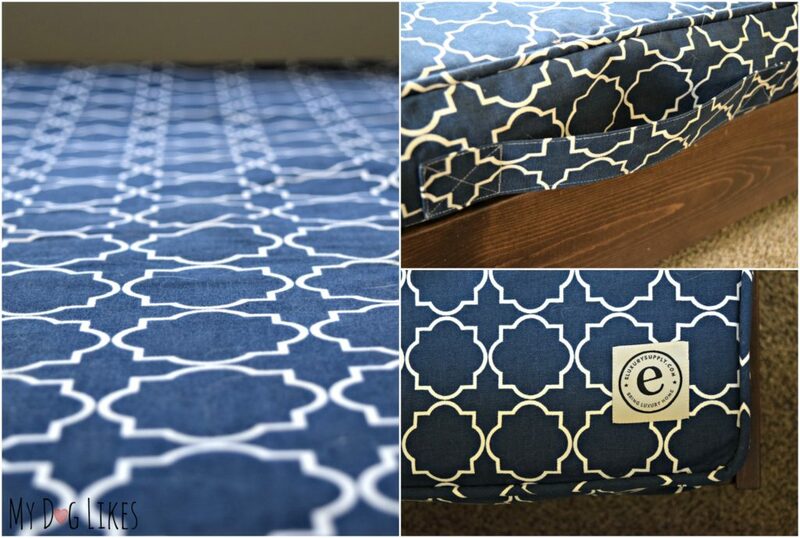 When we began to browse the brand new pet bed section of their site, we were amazed at all of the gorgeous fabric choices as well. While paw prints and dog bone fabrics can be lots of fun, in our house we like the dog accessories to fit in with the decor. eLuxurySupply’s pet bed fabric choices did not disappoint and come in an nice array of modern and fashionable fabrics and patterns. So, what fabric did our fashionable pups choose? Royal Blue – so chic! It was then time for our second choice…size! The new bed arrived at our house in just a few short days. 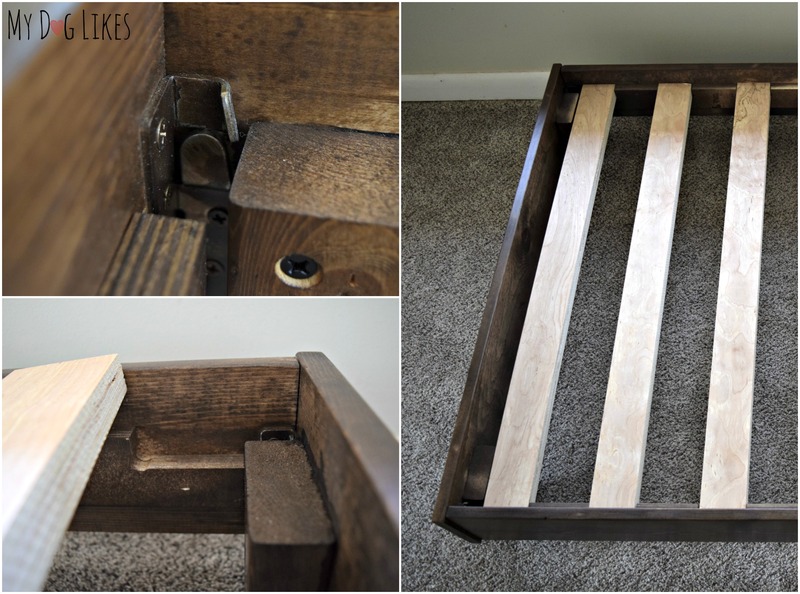 A quick examination of the 5″ mattress and solidly constructed wooden frame and it was clear that the “Luxury” in eLuxurySupply’s name was no joke…this bed was the real deal! These beds are more than just a pretty face- the most important aspect is the mattress itself! Each mattress has a multi-layer construction which combines high density foam with gel memory foam providing choice and optimal comfort for your dog. How you ask? The two layers of foam each have different levels of firmness! Lightweight – Thanks to a foam construction, this bed doesn’t weigh more than a few pounds. If you have ever had a different type of large dog bed you know that they can be a real challenge to move around! Easy to Clean – The fabric cover can be easily removed with a zipper to be thrown in the washing machine. The mattress is further protected by a waterproof cover for more serious accidents. 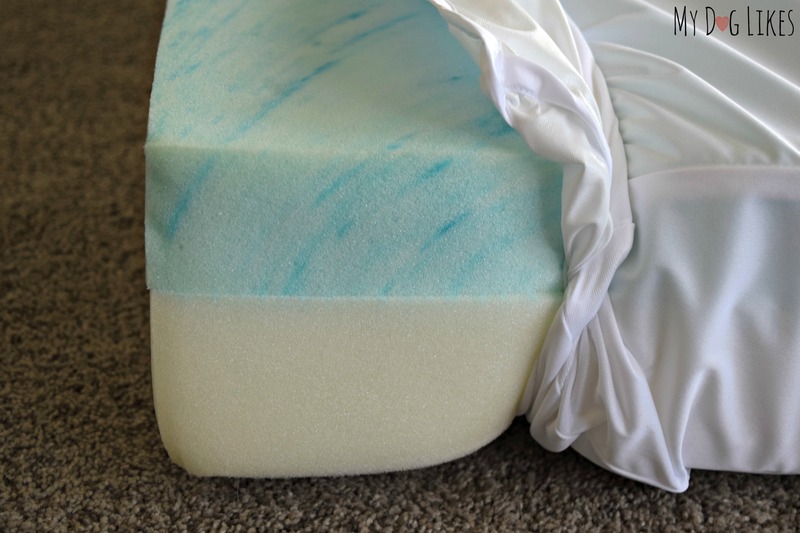 Reversible – Keep the gel side of the mattress facing upwards for a custom soft formed experience or the high density foam side for a stiffer more supported feel. 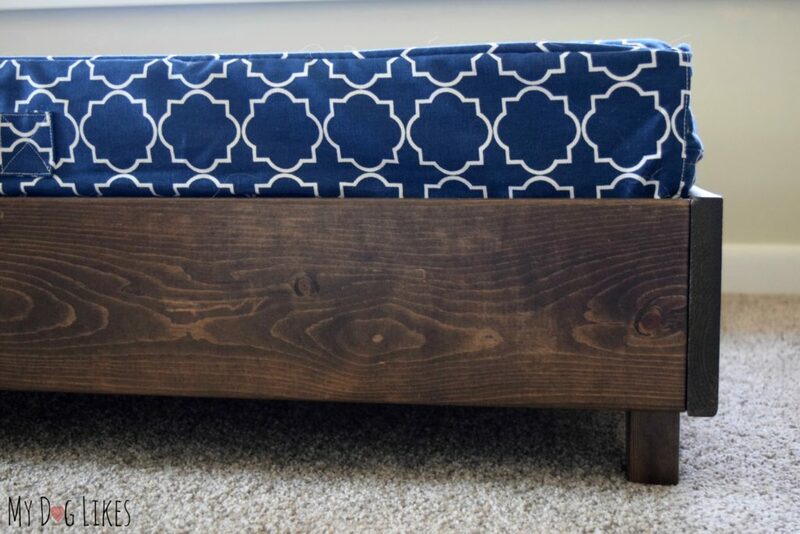 If you are looking for a more elegant solution to really “elevate” your dogs bed, eLuxurySupply’s solidly constructed bed frame is the perfect addition! Constructed of North American Pine with a Walnut finish, this frame assembles with clever interlocking brackets (shown in the photo below) and a series of wooden slats that drop in to pre-cut notches to support the load of the bed. The frame is absolutely GORGEOUS and really makes the bed look like a custom piece of furniture in your home. As we unpacked the frame from its box we were at first a bit nervous – there were lots of pieces! The bed frame looked like it was going to be a big project requiring drilling and screws! We looked through the whole box for assembly hardware before discovering that there weren’t any! It was really nothing more than a puzzle – no hardware or drilling required! Beautiful – While the fabric cover of the bed is beautiful on its own, the frame takes this bed to the next level and makes it look like a high quality piece of furniture. Simple to assemble – It only took about 3 minutes from taking it out of the box to getting it all put together. Best of all? No tools required! Heavy Duty – 7 evenly spaced wood slats provide plenty of support for even the largest and heaviest of dogs. We have tested it with more than 300 pounds with no issues whatsoever! Elevated – We have recently added a little human to our family and I love that the dogs have a bit of separation from the floor. This will be great as we teach our son that the dog’s bed is their safe (no baby) zone! Elevation is also really handy to allow for air flow. All dogs can be drooly, messy, and occasionally have bathroom accidents. We loved that the bed could be spot cleaned and we don’t have to worry about getting mold or mildew on the underside of the bed. Lastly, I love that this bed is elevated off the floor because I am clumsy and often stub my toes on furniture. The elevation of the bed is great for people like me! 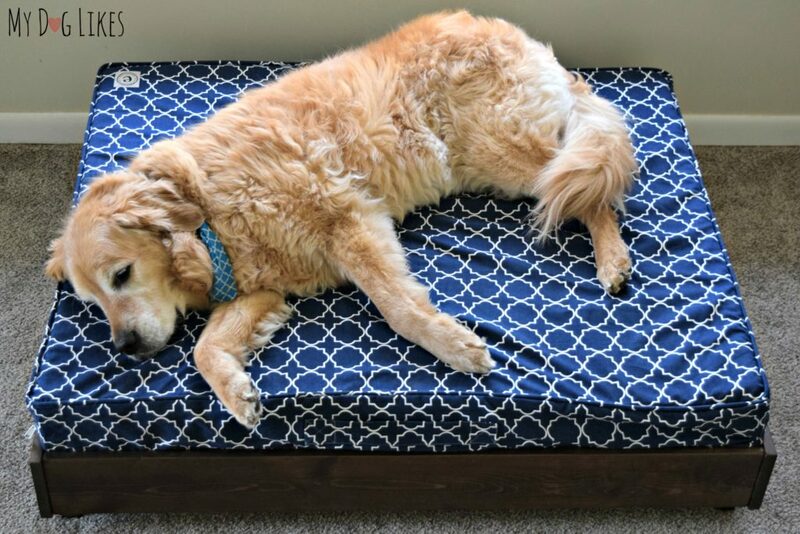 We have tried out a lot of dog beds over the years, but hands down, the orthopedic bed from eLuxurySupply.com is the best. Not only do our dogs love it, but it looks like it actually belongs in our home. This bed is not cheap, but as usual, you get what you pay for. The dogs have taken to it right away, and we love the additional support that it provides – especially for Harley’s aging bones! Want to give eLuxurySupply a try for yourself? Click the banner to check out their great selection! 2 of my girls sleep with me. all 3 used to sleep with me, but now my oldest b/c of her dementia and other health issues does not like to be up high, so she sleeps at the corner of my bed so i can keep an eye on her. i have several pads and orthopedic bed down for her. the girl also have beds in other rooms of the house so when i am another room, they have something to lay on. of course my girls are all welcome on the furniture. My dog loves to sleep at the side of my bed or on the floor by my feet. My dogs sleep beside my bed but one likes to get in bed beside me in the middle of the night. My dogs sleep with me at night and on their bed during the day. My dog sleeps at the foot of my bed every night on a blanket. I think this would be perfect for him! It is very supportive and only about 6in off the ground of you opted to add the frame. She sleeps beside my bed at night in her bed. My 2 dog babies sleep on our bed, but they are having a hard time getting up on the bed. I would use this for my elderly cats. I shelter 12 of them at the moment. They have old bodies that get sore. Wow, that is so awesome of you! Well, just so you know our kitty Lucas LOVES this bed too! Ellie usually sleeps on our bed or my 12 year old’s bed. One of ours has her own room because we give the cat the roam of the house and she can’t seem to get used to her. The other adores crates, so we keep one in our room and put a dog bed there for him. My dogs all sleep with me, and on the sofa. They both sleep on the bed or on the couch. My dog sleeps on the couch day and night. She takes up 3/4 of the couch. Right now mine sleeps on the floor next to my side of the bed. My dog Travis sleeps with us or his pillow bef…My other dog Poo Poo sleeps on the couch..
One of my dogs sleep with me and the other sleeps on a blanket right next to where I am sleeping. Our 3 dogs sleep in bed with us. Luckily they’re all small dogs. Lol. 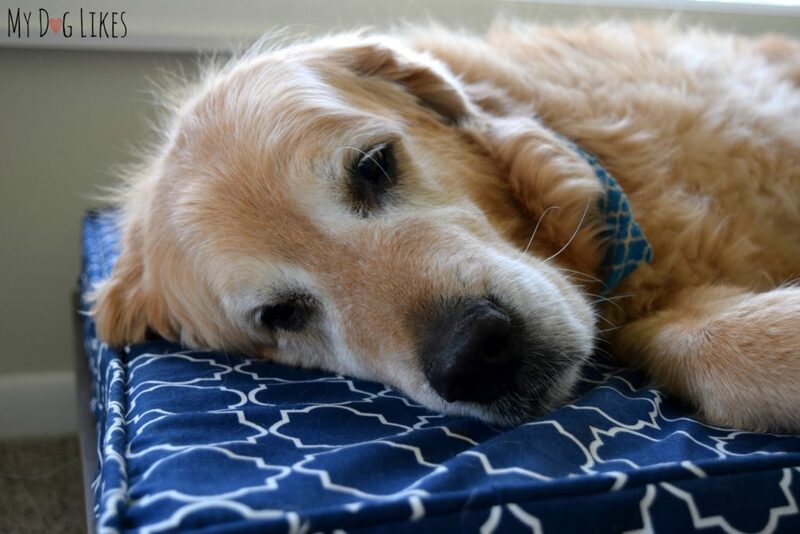 With Shasta’s arthritis this bed would be PAWfect to help him sleep/rest more comfortably! At night, my dog starts out in her crate with the door open. During the night, she moves into my bed. But she doesn’t like to start in my bed – she likes some individual quiet time first. My dogs sleep on the floor and slowly makes their way on the bed. I have 2 Boston’s, one of them sleeps in bed with me. My other one will sometimes sleep with me, but likes to curl up in a blanket on the floor. Our dogs usually sleep on the floor near our bed at night. And sometimes they sleep on the couch. Cody sleeps in my bed at night, but any other time, he sleeps in his little bed. He needs a bigger and more comfortable bed. He’s 13 and I want him to be as comfortable as possible! I have three rescued Treeing Walker Coonhounds who typically all sleep on my bed with me at night. Now that the weather is getting warmer, the two boys sometimes choose to jump off and lay on either the floor or the old dog bed in my room. I could really use another dog bed in that room and one in the TV room for my girl, Kyoko. She’s at least 8 years old (not always certain of age with a rescue dogs – she could be older). She’s starting to have issues with her joints and I’d love an orthopedic bed for her during the day. My dog sleeps in his bed in our bedroom. My dogs sleep in my bed at night but on the floor or a cuddle bed during the day. They are getting older so this bed looks very comfortable. My dog sleeps in my bed at night, and despite his small size, he manages to hog 2/3 of it. Might be nice for him to have his own bed. One of mine sleeps with me, another likes the couch and one likes the dog bed. When I’m still awake they’re on the floor. Once I get to sleep they’re on the bed. When I wake up in the morning, or middle of the night I have a Shepherd RIGHT beside my head and a Pitbull by my feet! I should just sleep on the floor, I’d have more room! I have two sweet girls they sleep on the floor next to my bed they are sharing a old pillow and in need of a new one this would be amazing my girls would be so happy. I have a Husky, that sleeps at the foot, of the bed and a Chihuahua, that sleeps between us, under the covers. I’d to have this bed, in a large, for our Husky, he’d love it. My dog Mia sleeps in her doggie bed everynight.She also has her own blanket that is on her bed. My dogs sleep wherever they want to. They all start in the bed with me then some eventually go to some of the pet beds in the vicinity. They are supposed to sleep on their blanket on the floor in my bedroom but they always sneak in my bed when they know I am asleep. My senior rescue dog Monty (who this would be for if we won!) doesn’t want to sleep on our bed. He likes to sleep on a bed on the floor at the foot of the bed. Right now he has an actually rather expensive bed that’s not orthopedic and supportive for him like he really needs. He’s 16 years old! Our dogs sleep in both the bed and the dog beds we have around. I guess they get hot or cold and change locations accordingly. He has a pretty nice donut bed we invested in, and it’s very close to my bed. I’d probably let him share my bed if I had a queen, but I only have a twin, and he’s a lab, so for now he’s on the floor. He gets to sleep on my bed until I get in, and then I boot him to the floor. This brand looks so nice, it is definitely #goals for me in the future!! I definitely can’t afford it now, as my parents paid for his last one, and I don’t have a regular income, but I’ll definitely have to remember this. Sometimes with us, sometimes in one of her beds either in the bedroom or out in the living room. Our small dog sleeps on our bed between us, and our big great dane has a bed in our bedroom and a bed by the front door…. she changes up where she sleeps! Our dogs sleep in the son’s bed. My dog sleeps in the bed with me, but I would love for her to have her own bed she can lie in during the day. I foster, so things are constantly shifting! One constant is that my little resident Pug sleeps with me in the Big Bed, that is a given. With fosters, it varies, some love the comfort & security of a crate, others like our couch or a dog bed. One thing they all love is when I put a nice comfy bed on my back porch in the morning for them to lounge after breakfast and enjoy the morning sunshine. Thanks so much for the oportunity! My dog sleeps on my orthopedic bed but sometimes he gets annoyed and sleeps on his bed on the floor – which is not orthopedic. He’s 12 and sure could use one! Lucky sleeps in our bed, hes lucky (lol) hes tiny, or he’d already have his own bed! He sleeps with me part of the night, then moves to the couch when he gets too hot. Usually our pups sleep on our bed. But they will sometimes sleep on the floor or their kennel if they feel crowded. I have one that sleeps with me and one that sleeps next to my bed on the floor, hes 10 so he cant get up on the bed anymore. This dog bed would be perfect for him! Two of my dogs sleep with me at night & another one on the floor. She would love to have this beautiful bed all to herself! My dog sleeps in the den which is right across from my bedroom. He has a bed on the floor in there. At night my dog Tillie sleeps in her kennel. She’ll sometimes nap in there during the day, but usually she lays on the soft area rug in the living room. She would really enjoy one of these beds – she’s getting up there in years and enjoys something soft and padded to lay on. My 12 year old Boston sleeps on the bed, under a lap blanket that’s on top of the regular blanket. one dog sleeps in my daughters bed the other one is in mine 🙂 both spoiled! they love doggie beds for naps so this would be perfect! My dog sleeps on an old couch left by the previous owners of the house or on the floor. My dog sleeps on his dog bed, which is not as luxurious as the bed you’re giving away. My dog sleeps on his current bed (cheapy one-getting old) in our living room. He would be extremely happy to win this new bed. Our pug would love this bed for hip Dysplasia. She has a different bed but the cat likes to take it over. This would be her bed. The two of them sleep on the floor of the kids room. This bed would do wonders for the older one which lost a leg to cancer a while back. She usually sleeps in my bed but she does have dog beds too. My dog sleeps in bed with me at night. My dogs sleep on their beds in the kitchen or on a mattress pad on my bedroom floor. My dog sleeps in his kennel because he’s still too young to be “lose” without supervision. But that is coming to an end and would love to get him a real bed just for himself! They sleep on their bed. One of our dogs sleeps on the bed, and the other sleeps on the floor in a cushy dog bed (he’s not a jumper). My dog sleeps in my bed at night; however, she has a kennel/crate that she likes to lay in during the day. My dog sleeps in her soft crate next to us because she jumps all night and nobody gets any sleep if she’s out. She sleeps in her dog bed at the moment. Both of my dogs sleep on the bed with me. She sleeps in our bed. Where else is there? Haha, spoken like a true dog mom! On her own dog bed, it isn’t quite this nice though. My dog sleeps beside me in the bed every night. My dog sleeps in his own bed but I always have to change them because he only likes to eat his treats and bones on the bed. She sleeps on my bed. My dog goes between blankets on the floor, my bed, and the futon. One dog sleeps in his crate and the other dog sleeps on the sofa. One dog sleeps in his crate which is his safe place. Another dog sleeps on a rug. Two others sleep on the couch that has sheets on it for easy clean up. I think we could use a real dog bed or two! My dogs sleep in the bed with my husband and I. One always burrows under the covers and one sleeps on top of or under the covers depending on how cool it is. Never a dull moment!! My dog sleeps outside, but we bring him in when it’s really cold. She goes between the floor of the bedroom and the couch. She’s getting older so she stays off our bed. She either sleeps in front of my bedroom door or in bed with us. Our golden either sleeps in our room on her bolster bed, throw rugs or the hardwood floor – depends how warm she is. My dogs sleep in their kennels or doggie playpen at night. On their bed next to my bed. My girl sleeps in her crate. Our dog usually sleeps at the end of the bed but sometimes he sleeps with the cat in the sunroom…I don’t know why they like the sunroom so much?? Right now he sleeps in my bed but he is such a bed hog that it would be nice to have his own place to sleep that he is comfy with. In bed with me, sometimes on his bed that does not seem as comfy as this one looks. They sleep in their beds that are on the floor in our bedroom. Oh ours move around quite a bit at night, but they always start on our bed. I think they get too hot…and move to the floor or couch. On a Blanket under our window. she has her own bed during the day but at night she sleeps with us! Dakota has sleep with us in the past, since her dog mate has past. She sleep downstairs in the living room. She is getting older and her hips are aching , but she still thinks she is a puppy. Miss Lillie sleeps wherever she feels like for the day. In the day she has a bed in the living room but at night she will most of the time sleep beside the kids bed. So Maybe, Just Maybe ~ I ~ Could Stretch out in My Own Bed and Get a Good Nights Sleep Too !!! Anywhere she likes! The couch, closet, with us in bed under the sheets, etc! My dog sleeps on her pillow most of the time sometime on the kids beds too. I lost my dog last year, so I plan to get another dog this summer. I would love for my new dog to have his own elevated mattress to sleep on. Thank you for the chance. My dog sleeps on a dog bed in our room. My dog sleeps on his bed in the utility room. Our two lab retrievers sleep in their house. I converted a child sized gazebo into a dog house for them. It is heated in winter and is right by the back door so I can get them inside during bad weather. Our male loves to come in with us and just lay down and he would love to sleep on one of these! Usually on the rug next to my bed, but they’ve been known to move to the living room or bathroom depending on the weather. sometimes at the bottom of our bed or under the bed! Amazing giveaway, thank you!! My one girl is getting along in years and she is a chow chow, her hips are wearing down, this bed looks amazing and I bet would do wonders for her!! Thank you and eluxury for this opportunity! My pup sleeps on the couch or on my sons bed. My old girl sleeps on the floor on blankets at the foot of my bed. Thank you for the review and giveaway. Our dog has a dog bed, but seems to prefer to sleep at our door. I think she would like a new bed. My dog sleeps in his kennel. Gidget has her own bed, but she is beginning to get stiff. She would rather we put her on a pillow on the couch as this much be more comfortable for her joints. My dog usually sleeps on a blanket on the floor or sometimes in bed with me. My dog sleeps in bed with me. My dogs sleep at the foot of my son’s bed at night. Rocky sleeps on the bed with me but when we travel I bring a dog bed with and he sleeps in that. It calms his anxiety. Right now she sleeps on the sofa,well its now her sofa lol. PS My dog sleeps on her bed or on the cold floor if she wants to cool off! My dog sleeps on my bed or on the couch or on the floor!! My dog sleeps in my room on bedding I have made up for her. My chihuahua sleeps right beside me. My dogs sleep in bed with me. my dog sleeps on my bed, like the little king that he is. My pup sleeps in his crate at night with his blankets and a bone to chew on! He would definitely love this awesome bed, would be a change for him for sure! Thanks so very much for the chance! Shayla sleeps in her dog bed that is right beside my bed. We are getting a puppy in june so right now we are looking to get him a bed. My Cooper starts out sleeping with me, but then goes to the guest bedroom bed. Guess I move around too much for him, lol! My 2 babies sleep with me and my hubby! Our dogs sleep on our bed,lol…. We need this. I dont have a dob, but I have a cousin who has 5 dogs. 3 of which sleep in her room. She sleeps in her own bed. That sounds pretty nice! Lucky pup! Usually, my 13 year old Jack Russell Lil Bubba sleeps next to our bed in a basket that has a dog bed in it. Lately he’s been sleeping at our feet on the bed. I think he’s trying to tell us something! Thanks for the chance to win! Sounds like it! Good luck! She either sleeps on our bed or on he floor by the bed. Two of our dogs sleep on the bed. The third prefers her own bed on the floor next to ours. Right now my dog sleeps on an old pillow next to our bed. I either wake him up with my tossing and turning, or he wakes me up with his changing position. Plopped right against me in the bed. I wouldn’t have it any other way at night but during the day she lounges in her puppy beds. One of my dogs sleep with me and the other one sleeps at the foot of my bed. Our dogs like to roam around the house at night. They like to start in our room but when we get up in the morning, they are usually out laying on the couch. My oldest bulldog sleeps on the living room floor because it is too hard for him to climb steps. My dog sleeps in my bed. Ripley “fluffs” his bed before lying down. They get torn to shreds in short order! He’s an old boy and could use a decent bed.